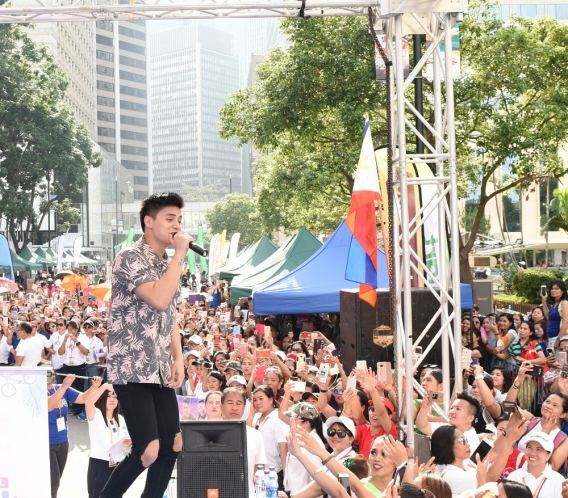 QUEZON CITY, Philippines - July 6, 2018 - PRLog -- ABS-CBN's "Just Love Araw-Araw" celebrations continue to soar as The Filipino Channel (TFC) brought the entertainment caravan to the 120th Philippine Independence Day in Hong Kong and Taiwan on June 10. The largest and leading Filipino-owned media and entertainment company, ABS-CBN kicked off the "Just Love Araw-Araw" campaign in the Philippines in April by spreading small acts of love by Filipinos despite the daily challenges in life. Meantime, on the other side of Asia, ABS-CBN also shared the #JustLoveArawAraw celebrations with the Filipino community in Taiwan during the TFC Hour at the triple celebration of the annual Philippine Independence Day, Migrant Workers' Day and 3rd FILCOM Friendship Fun Run. The unstable weather did not douse the afternoon gaiety as Padilla and Negi entertained the audience with games, song, and dance. More than entertainment, TFC marked the milestone as the biggest gathering of overseas Filipinos in Taiwan to date. The "Just Love Araw-Araw" events are also not only a celebration of our 120th Independence anniversary but also a show of unity, especially among overseas Filipinos who left the comfort of their homes to achieve a better life for their families. For more updates, visit facebook.com/TFCHongKong, facebook.com/TFCTaiwan1, or visit TFC's Facebook page applicable for your area. Connect with fellow global Kapamilyas and follow @KapamilyaTFC and KapamilyaGlobalPR on Twitter and Instagram.